A series of AM60-1Ce-xCa (x=0, 0.5, 1.5, 2.5) magnesium alloys were prepared by gravity casting method and analyzed by means of XRD, DSC and SEM. 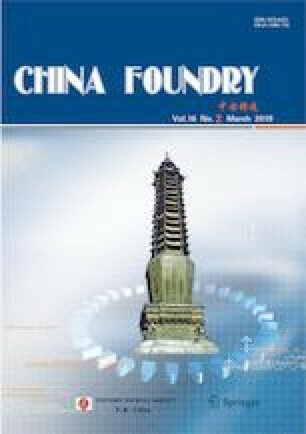 The effects of Ca on normal temperature mechanical properties and high temperature creep behavior of alloys were characterized by tensile and constant creep test. Microstructure analysis indicated that Ca was preferentially combined with Al in the alloy to form the high melting point Al2Ca phase at the grain boundary. The addition of Ca can refine the crystal grains and reduces the content of β-Mg17Al12 phase. With the increase of Ca content in the alloy, Al2Ca phases at the grain boundary gradually changed to the network of lamellar structure, and replaced the β-Mg17Al12 phase as the main strengthening phase gradually. The creep resistance of the alloy continuously increases because the high-temperature stable phase Al2Ca firmly nailed at grain boundaries impedes the sliding of grain boundaries. However, when the addition of Ca was more than 1.5%, mechanical properties of the alloy started to decrease, which was probably due to the large amount of irregularly shaped Al2Ca phases at the grain boundary. Experimental results show that the optimal addition amount of Ca is 1.5wt.%. Yu-lai Song Male, Ph.D. His research interests mainly focus on corrosion and protection of magnesium alloys, including stress corrosion cracking, pit corrosion, galvanic corrosion, micro-arc oxidation, and laser cladding. To date, he has published more than 30 papers. This study was financially supported by the National Natural Science Foundation of China (Grant No. 50901035), the Science and Technology Development Projects of Jilin Province (Grant No. 20140204042GX), and the China Postdoctoral Science Foundation (Grant No. 2018M642625).